You may want to get the party started, but first you need to figure out what to feed them! Wellworks For You would like to give you our top 3 super-delish EASY Cinco de Mayo recipes. Get ready to blow your guests’ minds with our yummy recipes! Not only are they delicious – they are healthy and clean eating for everyone! Simple but delicious…You can never go wrong with chips and dip! Mix all ingredients into a bowl until smooth and chow down. Did you know that avocados are high in fiber, vitamins, and monounsaturated fat? One of the healthiest foods you can eat, in one of your Easy Cinco de Mayo recipes! Munch on and enjoy. You may have to invest a little more time into these beauties than you did with the guac & chips – but it’s all worth it. Gently mash the black beans and cheddar cheese with ½ teaspoon of salt in one bowl. Divide evenly into 8 tortillas, rolling them up individually. Heat the olive oil in a large skillet and fry them, starting seam side down, 2-3 minutes per side. Serve with salsa and sour cream. 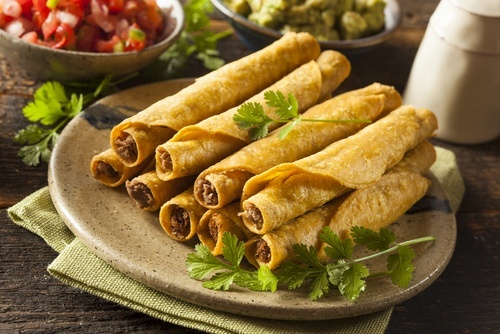 In fact, if you made our first recipe, you can serve these with guacamole as well! Come on… we know your mouth is watering! Still easy as pie! Or in this case, quesadillas! You can never go wrong with quesadillas, and you can add whatever you want with these beauties. Heat up your broiler, place 2 tortillas on a baking sheet and sprinkle a ½ cup of cheese evenly over each tortilla (and cooked meat if you choose to be so bold). Top with another tortilla. Broil until crisp, about 1-2 minutes per side. Repeat with remaining tortillas and fixin’s. Cut into triangles and serve with salsa. How do you feel about your Cinco De Mayo party now? With these 3 easy Cinco de Mayo recipes you can focus more on hanging with your company rather than cooking all day. Here at Wellworks For You, we hope you enjoy these easy recipes and we look forward to bringing you more simple, healthy recipes in the future. For more information on how Wellworks For You can get you on the right step to Wellness – give us a call at 800-425-4657.